Greetings again from the MS Veendam . As I write this, we’ve just completed our port day in the area of Costa Maya, Mexico. My wife and I went diving again, and yes, that means we have more fish pictures. However, I’ll spare you the underwater camera work today (well, maybe just one image in the gallery ), and instead talk about what went on yesterday, last night, and today in general. Yesterday we were in Santo Tomas de Castillo, Guatemala. The ship docked at a very busy commercial dock, as you can see in the latest image gallery. While it was kind of fun to watch all the frenetic dock activity, the Guatemala dock is clearly a commercial operation first, and a cruise ship drop-off point second. 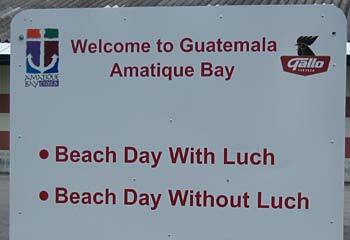 After diving on Tuesday, we chose to take it easy in Guatemala, and decided to just spend the day relaxing at a local beach resort. Overall, while I had a pleasant afternoon, it was definitely not the highlight of the trip. Perhaps I should have known things might be a bit tough when I spotted this sign after getting off the ship. (We had chosen the “no luch” — or lunch, for that matter — option.) The Amatique Bay resort featured a number of pools and water slides, bike and walking trails, paddle boats, a restaurant, and that staple of all great resorts, a “floating” bar within one of the pools. They also had some animals on exhibit—a number of turtles in one, and five iguanas in another (we also saw several wild iguanas up in the trees). There’s a photo of one of the captive iguanas in the gallery. If it hadn’t been 90 degrees with 100% humidity, we might have had a lot of fun trying all the different outdoor activities. As it was, we spent the whole morning in the pool, then returned to the ship on the first available water taxi. Dan Frakes had a much more interesting experience, as he went on a full-day hike through the rain forest. Looking back on it, that’s the option we probably should have taken. We then departed Guatemala, headed north for the Costa Maya region of Mexico. Shortly after departure, four speakers—Dan Frakes, Ted Landau, Andy Ihnatko, and myself—presented cruisegoers with our personal greatest (worst?) Mac disasters. From tales of dead hard drives to thinking one machine was another to spilling soda pop into a variety of machines, it was an entertaining 90 minutes of self-deprecating story telling—yes, even Mac writers are stupid users, too! We even had a couple of attendee-contributed horror stories, as well as Andy’s admission that he once installed his own, modified version of Apple OS onto an entire lab of Apple IIs during his younger days. All in all, it was a lot of fun. After the session, it was time for dinner. And dinner time on a ship can be quite entertaining. For the last two nights, we’ve had entertainment of some sort. We all wore chefs’ hats one night and Dutch hats the next. The remaining pictures shows our napkins arriving for the meal in a rousing song-and-dance routine. I’ll grant the cruise staff this: they really do work hard to make the evening meal an enjoyable experience. After dinner, it was time to retire to the cabin for the cruise north to Mexico. Which gives me a good excuse to talk about the towel critters. Every night while we’re at dinner, the cabin attendants prepare our room for the evening—turning down the bed sheets, putting tomorrow’s itinerary on the desk, etc. But the crowning achievement of this service are the creatures they create from towels. I neglected to take a picture of the first one (which might have been either an octopus or a ghost), but the gallery holds the other three we’ve seen—an elephant, a lobster (scorpion? ), and a sting ray. The skills of the crew are indeed many and varied! Costa Maya is a most interesting area of Mexico. It’s largely undiscovered (hard to type that with a straight face, as our 1,500+ person cruise ship is but one of seven or so they’ll see this week), and is quite undeveloped relative to Cozumel, Cabo, Cancun, etc. The nearby fishing village, Mahahual, is home to only 600 or so, and there isn’t a huge hotel complex to be seen. The diving here was in many ways nicer than Belize—particularly the fact that the dive site was only 10 minutes offshore. There was also a diverse assortment of coral, and so many fish that you soon stopped trying to look at all of them. I don’t expect this area to remain undisturbed like this for too many more years; it’s definitely worth a visit if you’re looking for a spot that’s not the normal tourist-overrun destination. And now, I’m off to listen to Dan Frakes’ talk on the essentials of maintaining your Mac. Just as Dan begins, we’ll be heading to sea for the long sail back to Tampa, where we’ll arrive at 7 a.m. on Saturday.